Just finished some Rimboche AB in a cob. My first go with this stuff. Quite good, I think, but I would have totally flunked a blind review. I was really hard pressed to pick out any of the components. I haven't smoked a ton of D&R stuff, but I've liked everything I've tried, and I think they deserve a little more attention than they get. None of it is knock your socks off type stuff, but it's impressive in its own way. Dead simple, no nonsense tobacco. I look forward to finishing this tub, and I wouldn't be surprised if more finds its way into the cellar. Just finished the after dinner bowl of HH Acadian Perique in a re-stemmed Grabow Lark. I tried this mixture in a bigger pipe and it just tasted muddled. This is the first tobacco I've tried that tastes noticeably different in different-sized bowls. All this talk of Mr. Eastwood's "spaghetti" Westerns makes me want to recommend the original "The Magnificent Seven". Had the pleasure of watching it and "Singin' in the Rain" over the weekend. Been catching up on my C.S. Lewis over the weekend, double-diving into The Abolition of Man and Imagination and Reason. I didn't know until recently that he was a WWI veteran & contemporary of J.R.R. Tolkien. My mind has been so numbed by contemporary fiction that I find myself having to take in Lewis's essays a sip at a time, but it is invigorating. Coffee and ice water alongside. Enjoyed a tasty navel navel orange and am now smoking year 2014 Capstan Blue in a 2014 Savinelli Gaius smooth brown slight bend tapered black acrylic stem and ferrule 320KS author. Extremely interesting. I do agree. Very much. 2012 Squadron Leader in a Caminetto Business 155. I love that pipe @Tnfan....the way you wave it in my face, I know you do too. C&D Super Balkan, Grabow. Just about time to call it a day. Enjoyed a tasty Jazz apple and am part way through this bowl of Edgeworth Ready Rubbed Match in a very much appreciated 1979 brown, slight bend grain etched flat front Stanwell Rego 969-48 (09) with a black vulcanite stem. I'll likely finish my smoking day with this bowl. Reading Giddins' book on Bing and am down the home stretch, headed for home on this tome. I'll likely place first tomorrow, though. Good morning. DFU in a John Hines Dublin? Fresh coffee at hand. Never got to sleep, so I'm up and smoking W.O. Larsen Black Diamond in a 1975 medium bend sandblasted looking, smooth on the sides yellow Pioneer meer with a black ferrule and vulcanite stem in the military mount style. Watching Wanted: Dead or Alive. Woke up to find my cell would not turn on. Thought I had some malware, but found a couple of suggestions online and got it back on. It was a little discouraging to have the screen lit up with the battery icon saying 100%, but it wouldn't boot. Did manage to start a cob mod by Norm filled with Storm Front and pour a cup of coffee while I was fiddling around with it. Whew. 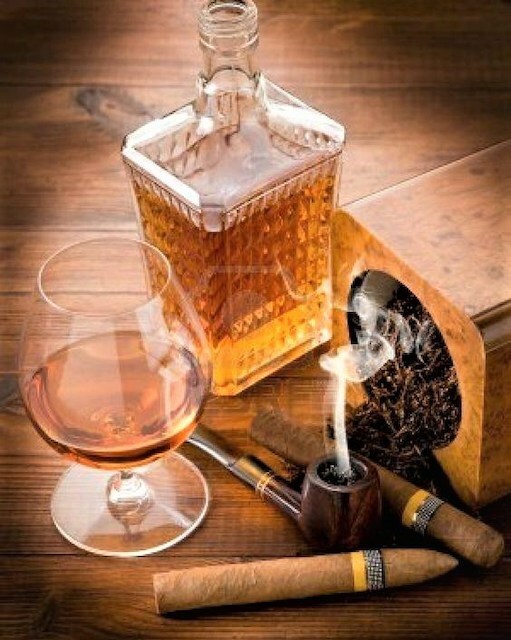 Good morning, had a fried pork chop and steak biscuit for breakfast, now for that first smoke of the day, Sir Walter Raleigh in a Legend Rob Roy. Water to drink. More McC 40th Anniversary Flake in my Peterson Atlantic106. 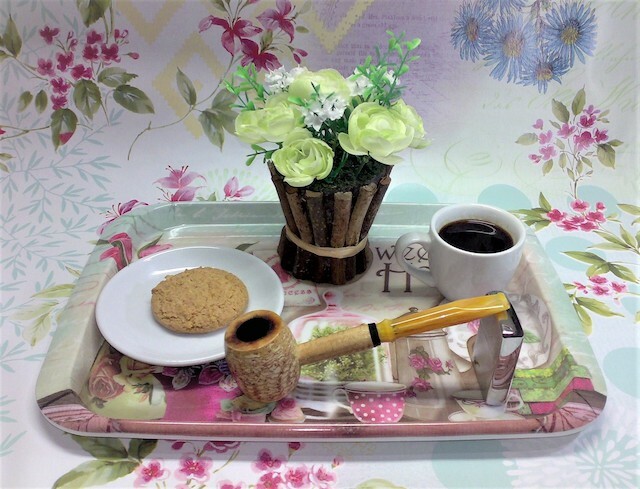 Now ready to enjoy some Mac Baren Scottish Mixture in a Ropp Canadienne -- with more coffee. I'm smoking Dark Flake in a Savinelli Hercules 611 and drinking a huge mug of Tea along with a few pinches of 6 Photo Cheeta. Some 2016 Margate given to me a couple years ago by secret santa at PSF. In a Ser Jac. Enjoyed a couple of ham, egg and cheese biscuits, and am now smoking year 2011 Villiger Virginia No. 444 in a 2002 smooth natural straight silver banded Ardor Venere Extra Fatta A Mano Maigret billiard, signed by Dorelio Rovera and a black acrylic tapered stem. Simply Apple is my drink.